Celebrating the Global Launch of the New Renault Clio, Bassoul Heneine and Renault Lebanon are launching a design competition aimed at inspiring and rewarding creativity, dreams, passion and individuality. Design students and professionals can download the Renault Clio package and design their Renault Clio on Photoshop, Illustrator or any other photo editing software. They later upload their design on the application. Winning Process: All designs are moderated; and when accepted, will be uploaded to the Renault Clio Design Gallery. Participants whose designs appear in the gallery need to invite their friends to vote for them. However, the final grade is calculated based on 50% Jury Votes, and 50% public voting. The Jury: A prominent jury will appraise the submitted designs. The Jury members are, Ms. Mia Bassoul, Marketing Manager for Dacia and Renault in Lebanon, Mr. Yann Jarsallé, Lead designer extérieur- Renault France, Mr. Patrick Boustany, principal Architect and Co-founder of AB architects, Ms. Nathalie Fallaha, founder and catalyst behind Vit-e design studio and Alephya, Mr. Cyrille Najjar, founder of White sur White, and Ms. Kareen Andraos, Teacher of Interior Architecture at ALBA. The Prizes: 10 prizes are offered equally divided between university students / design professionals and the general public. Prizes include: Internships, Renault Clio for the weekend, iMac, Vestel android tablets. 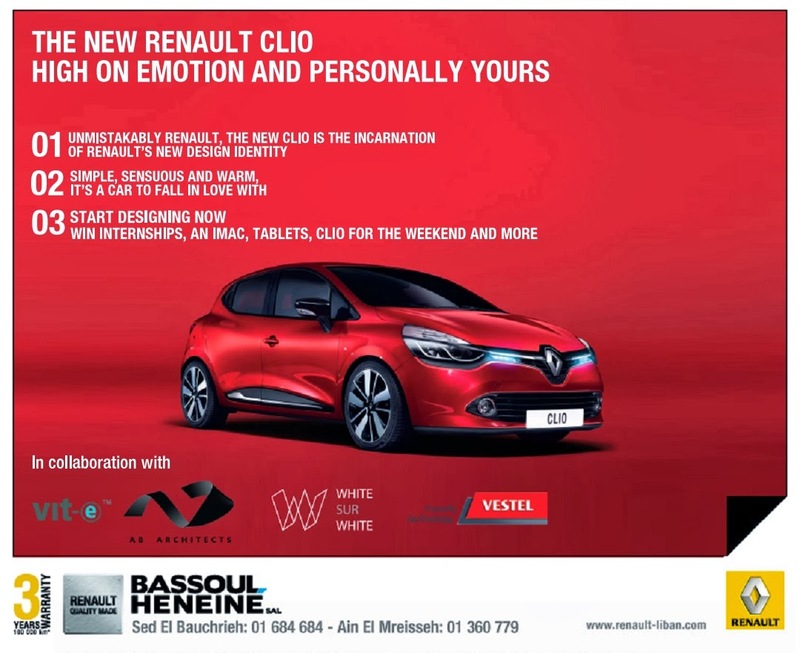 The winning design will be printed on an actual Renault Clio and showcased at Bassoul Heneine showrooms and dealerships; and will be featured on all Renault Lebanon’s Social Media channels. The Dates: The design competition launches on Renault Lebanon’s Facebook Page on Tuesday October 22nd until December 31st, 2013. The winners of the competition will be announced January 15th, 2014.